Over fifty years ago, Gilberto Gerena Valentín was our Latino Al Sharpton. In 1964 he led demonstrations against the police killings of three Puerto Rican men. He was a New York City Councilman (just like Bernie Sanders, he served as a Socialist), a union organizer, and a civil rights leader. Now he is gone. In the mid 1960s, Gerena Valentín organized a citywide rent strike to call attention to slum conditions, and to rat and roach infestation in El Barrio and the South Bronx. He led prayer marches and school boycotts to protest school conditions, and the de facto segregation in NYC public schools. 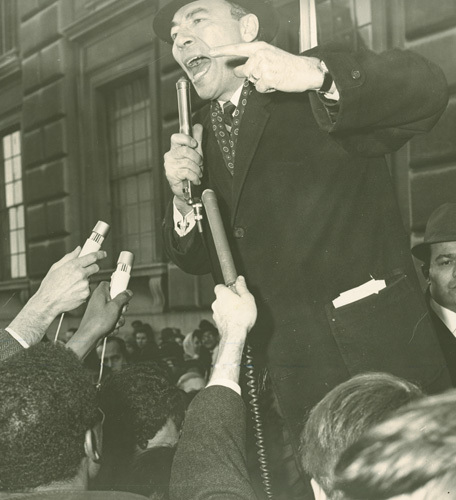 Just like Congressman Vito Marcantonio, he was the people’s champion. Just like Johnny Appleseed, he spread seeds of hope throughout the Puerto Rican community. He helped to found the Puerto Rican Day Parade, the National Association for Puerto Rican Civil Rights, el Congreso de Pueblos, the Puerto Rican Community Development Project, and the Puerto Rican Folklore Festival. Gilberto Genera Valentin, a powerful speaker. A visionary. Totally dedicated to the cause of his people. He is now in the tender hands of the all mighty God. Assemblyman Jose Rivera who is Chairman of the Democratic Party in the Bronx asked Senator Hillary Clinton to take action to bring a final solution to end the “colonial” s tatus of Puerto Rico and to bring a presidential debate to New York for the latino community with El Diario La Prensa. She agreed to do her best to satisfy those requests. Gilberto Gerena Valentín, an 89 year old leader of the Puerto Rican community for over 50 years, was my greatest hero telling Senator Clinton and the audience that he wants to help 15 Puerto Ricans in one hundred towns of Puerto Rico who need a GED to earn that GED and put them into universities. He also told the people that the dropout rate is fifty percent in Puerto Rico, which is worse than the dropout rate in New York. The Hispanic Federation and the Hispanic elected officials will not tell the people that out of 1 million people living in Puerto Rico who need a GED that fewer than 2,000 people passed the GED in 2005 and that only about 10,000 took the GED. Puerto Rico has fallen on its face and has become the worst in the nation with those horrible statistics. I urge the Hispanic Federation, Hillary Clinton, Jose Rivera, Gerena Valentín, and the elected officials to call a March on San Juan to protest the failure of the Puerto Rican government to help its own people. Gerena Valentín should be the poster “child” for the GED in the Hispanic community across the United States and Puerto Rico. Jose Rivera and Gerena Valentín can create a brochure for the GED to be distributed by the Puerto Rican Task Force to promote the GED in New York State that can be distributed by all Latino elected officials in their offices to a community that needs the GED badly to get into the university and to qualify for jobs in the trades and civil service jobs. Hillary Clinton can appoint Gerena Valentín to be the national spokesperson for the GED in the Latino community. George Bush gave us the little known Special White House Commisssion for the Excellence of the Education of the Hispanic and I believe that Gerena Valentín can do more for the Hispanic community and the Hispanic family than that commission has done in five years. Hillary Clinton spoke about universal pre-kindergarten, proper funding of No Child Left Behind, and providing more Pell Grants and scholarships. She shook up the audience by telling people that some states know how many prison beds to provide by looking at the third grade reading scores. She also told the audience that she feels that the Congress must compromise on the pending immigration legislation and that although she favors uniting families among the undocumented immigrants and the legislation does not provide for that, it would be acceptable to compromise on that point. By the time Hillary Clinton arrived, the Hispanic Federation had brought together many of the Hispanic elected officials including Jose Rivera, Jose Peralta, Hiram Monserrate, Phil Ramos, Carmen Arroyo, Luis Diaz, Adriano Espaillat, and representatives of other offices. Bronx Borough President Adolfo Carrion spoke, too, but he had to leave. I got a chance to meet Gerena Valentín and he asked me where I was from and I told him that I was from New York. He asked what me what I am and I told him that I am Jewish. He lightly kissed my cheek as I told him that I am “El Judío Maravilloso.” We are going to network to help the people of Puerto Rico. I will also be emailing Jose Calderon of the Hispanic Federation with information about how we can get more teachers (100 I believe) to teach GED to adults in the City of New York for the Fall term. Gerson Borrero told me he has been reading my GED articles. This famous reporter and editor of El Diario La Prensa, apparently was not convinced by Hillary Clinton’s speech, as he spoke with Jose Rivera and others in the lobby. It is always hard to get everyone’s support. We all have our own political views. May he rest in peace!! “A lion is gone: Gilberto Gerena Valentín … “. Thank you for all you’ve done! !